Susan Cameron has been a teacher for accent reduction and a dialect coach for many years. She has developed her own method to help foreigners reduce their native accent when speaking English and master the English pronunciation. So after many years teaching her method, she decided to turn it into a book. Perfecting Your English Pronunciation will teach you the English pronunciation and how to reduce your native accent in three steps. First, you learn to pronounce all the sounds of the English language, which can be a challenge if some of them are not present in your native language. Here, the difficulty is that we tend not to be able to hear a sound if we can’t pronounce it. But thanks to Susan Cameron’s method, with the help of videos, you can learn to pronounce a sound before you can actually hear it. This is really brilliant! The second step involves learning the stresses for each word. The English language is indeed a stressed language, in which all the syllables of a word don’t carry the same weight. So in order to master the English pronunciation, you need to learn where the stresses are for each word you use, as well as understanding the consequences in term of vowel modification on the other syllables of the word. This process is very clearly described in Susan Cameron’s book. The third step consists in deciding which words in a sentence are important. They are called the operative words. It means that they will carry more stresses than the other words in the sentence, and that can lead again to some vowel modifications. Again, this process is very clearly explained and Susan Cameron gives a system to work on this third step. The book is really brilliant, and is accompanied by audio files and videos. 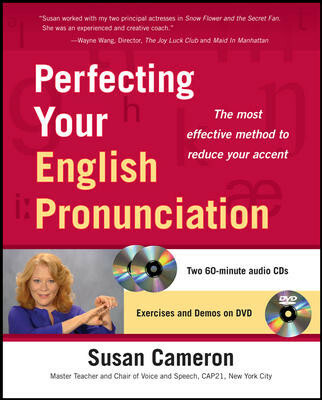 A must read if you want to improve your English pronunciation or are in a position to teach other people to do it!